Tuesday night was my late night so no dinner for me. Colin had sausage and mash with his favourite pork and sage sausages. No picture of Colin in action but Wednesday night was his cooking night and it was a triumph! 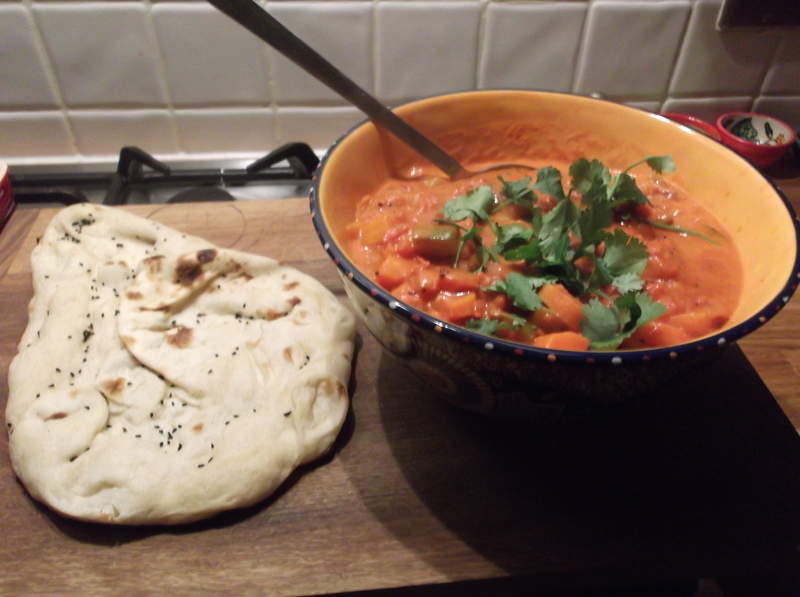 This was adapted from a magazine recipe called Chilli Marrakesh. The adaptations made were to use beef mince instead of the recommended lamb mince- although I think we will make it with lamb mince next time as the spices would work even better. 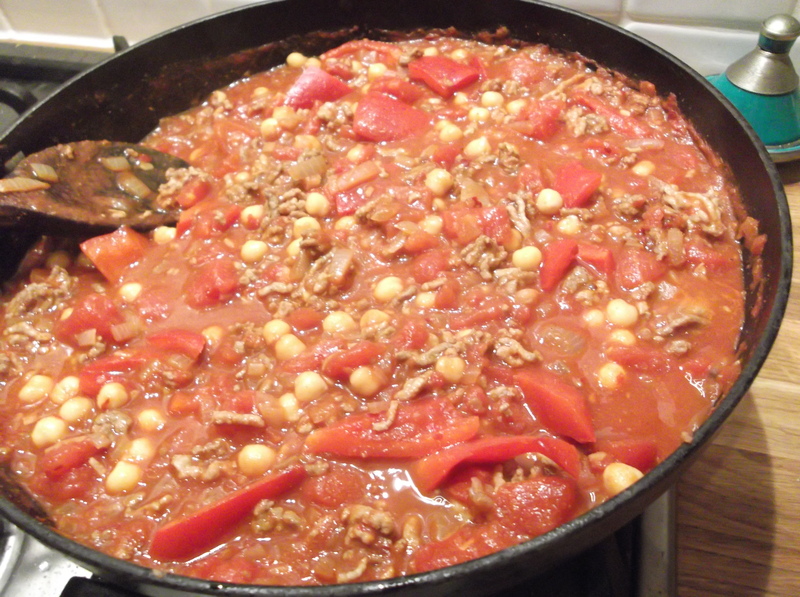 There was alot of harissa, ground coriander, ground cumin and paprika alongside red peppers, fresh ginger and tomatoes. Chickpeas are used in place of kidney beans in a usual chilli. It was absolutely delicious and I am delighted that there is another portion ready for my late night at work on Friday! Yummy! All good holidays come to and end so back to work we have been! Tonight for dinner I made a pizza with a really good pre-made pizza base. I topped it with some tomato sauce, piccante salami, red peppers, onions, jalapenos and some very fresh buffalo mozzarella. It was delicious if I say so myself- nicer than a bought in pizza as you can put on as much tomato sauce as you like, and we like alot of sauce! A green salad as accompaniment and a few fried potatoes for Colin. The final day of our holiday was spent in front of the TV! Morning watching the tennis, afternoon watching the Daniel Craig version of Girl With the Dragon Tattoo, and an evening watching Meryl Streep in The Iron Woman. All very entertaining and a good end to a great, restful week off. So, an old favourite for dinner, unbelievably for the first time in 2013! 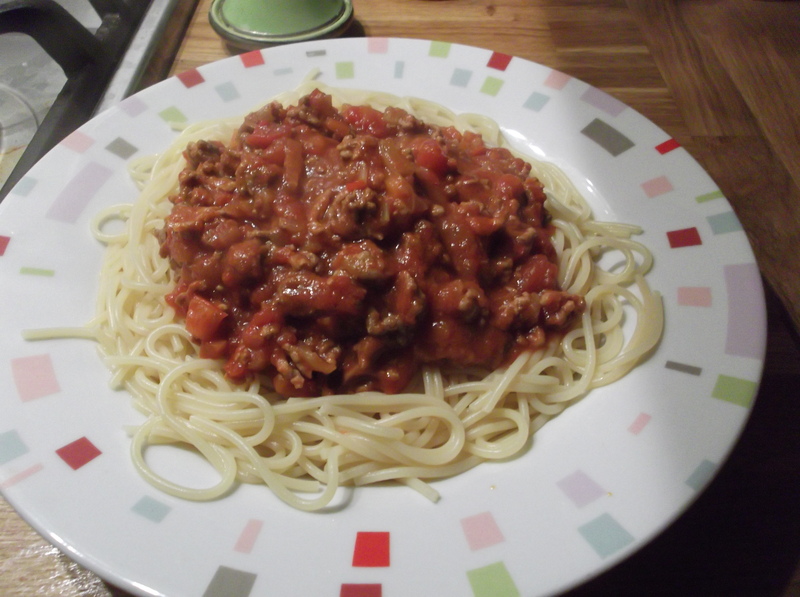 Spaghetti Bolognaise! I made sure I gave the sauce plenty time to reduce, making a thick, juicy and slightly tangy sauce. It is definitely worth using both pork and beef mince as it gives the sauce real depth. Instead of white wine I used a small glass of sherry, which I do more and more as it means you don’t have to open a new bottle each time (and have the temptation of a super cold bottle of white wine calling you from the fridge!). Towards the end I added a tbsp on lemon juice which does something lovely to the tomatoes. I simmered the sauce for 2 hours and served it with spaghetti, al dente, and a crispy green salad. Some chocolates for dessert and early night- a 5am start ahead!!! We are nearing the end of our week off and I am feeling very sad, but rested, all batteries recharged. For lunch we popped along to Teddington and went to Carluccio’s- the food is consistently tasty but today it was more than a little chaotic as there was a very big table of ladies, all with little people and buggies. In fact you could hardly get in the door for buggies, which might not be the best welcome when you are looking for a relaxing lunch out. 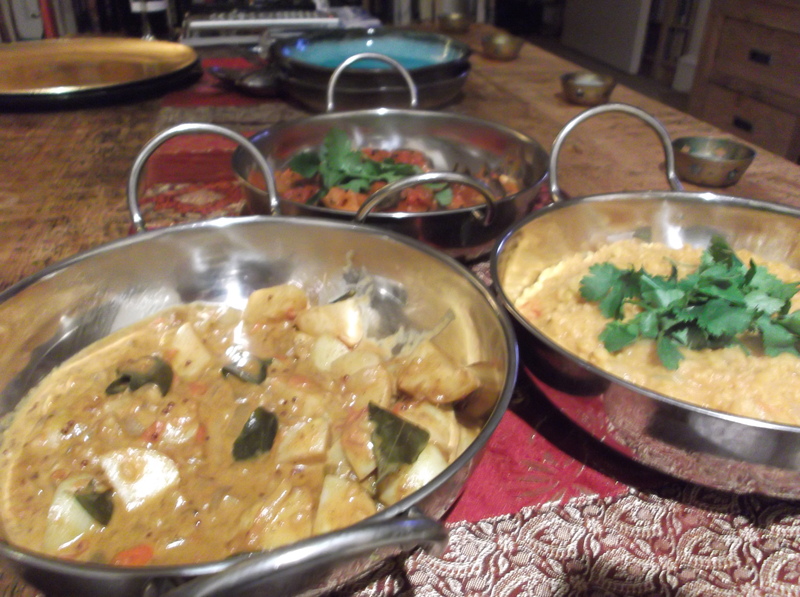 We had a South Indian Potato Curry- lots of mustard seeds, fresh curry leaves and coconut milk. This was truly delicious- next time I will par boil the potatoes first as they took so long to cook in the sauce and I didn’t want to spoil it. Second up was a Bangladeshi Dal which was cooked differently to how I would normally tackle it- onions and tomatoes fried first with the spices before adding the red lentils. I finished it off with a dash of coconut milk instead of the butter it suggested and this gave it a richness which it needed. And last but not least was a tomato and aubergine curry- fresh tasting, lots of chilli, cumin and mustard seeds, perked up at the end with a good squeeze of lemon juice. Delicious. 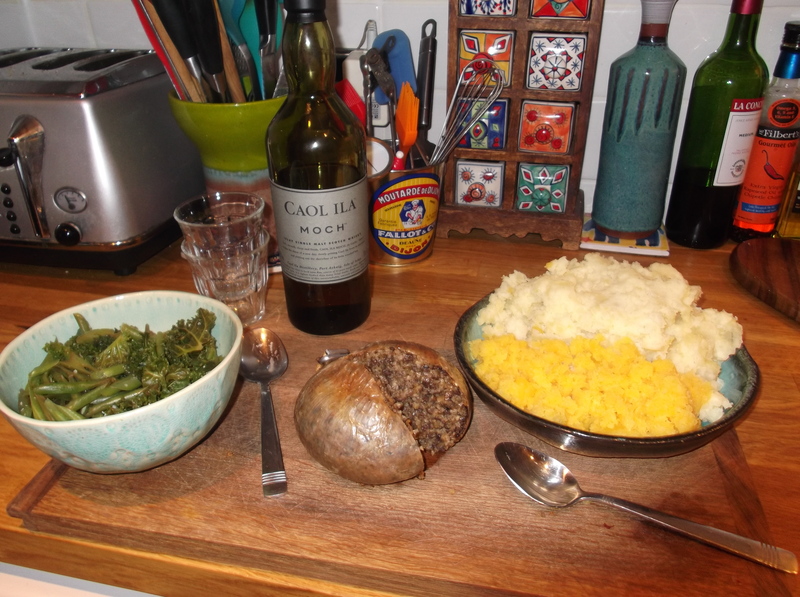 We are not Scottish, and Colin isn’t particularly bothered about haggis, but we decided to have haggis, neeps and tatties! And it was ok, but just ok- I did have massive indigestion afterwards. So we will stay true to our English roots from now on! 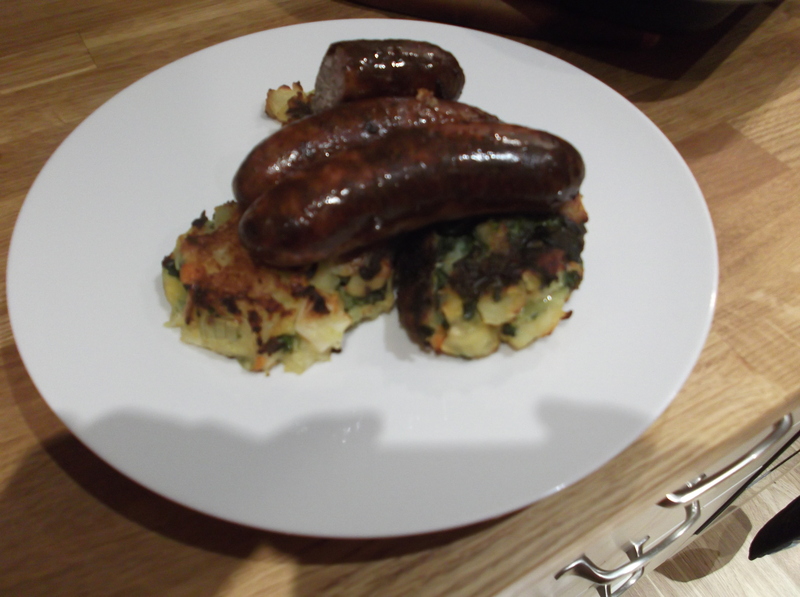 Tonight we have had sausages with root veg colcannon cakes and onion gravy. boil the potato, carrot and parsnip until just cooked. Drain and roughly mask. in a large bowl mix the root veg, onion, kale and salt & pepper. Leave to cool. take a handful of the veg and form into small burger shapes. heat some oil in a frying pan and fry the cakes on both sides until browned. pop onto a baking sheet and keep hot in the oven until the sausages and gravy are ready and the cakes are hot through. 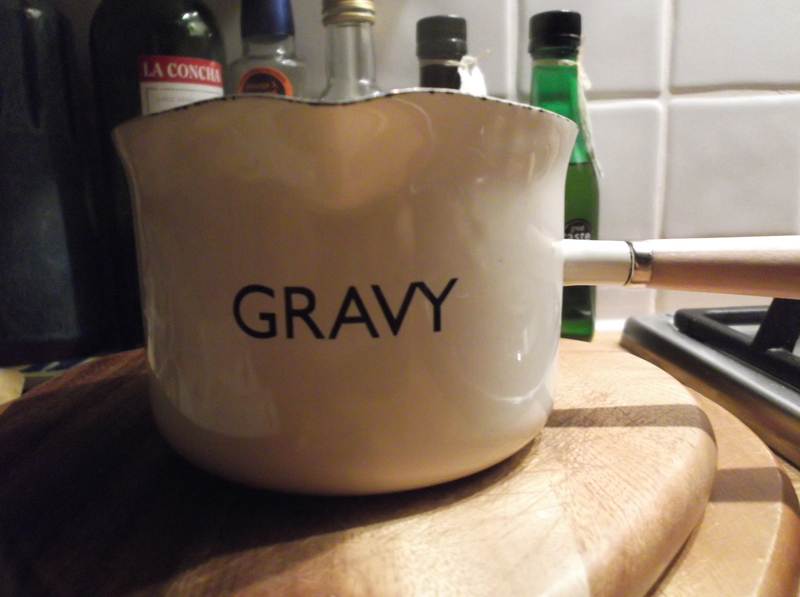 I should’ve made the gravy but I was feeling very lazy! Venturing out into London, battling the crowds and a little snow flurry, we had a great lunch at Pierre Victoire- check out the restaurant page for pics and what we ate. After such a lovely meal we didn’t fancy a huge dinner but wanted something tasty and a bit spicy. 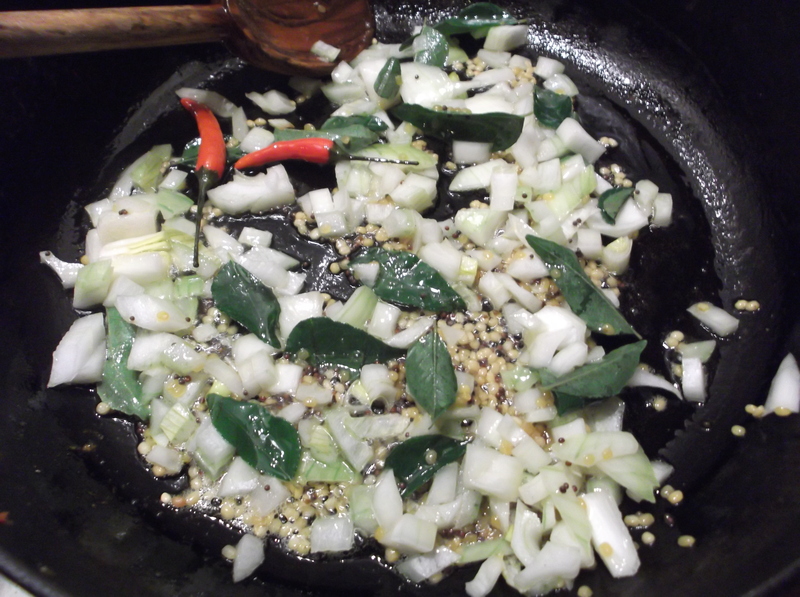 So it was a take on the Keralan Fish Curry (3rd January 2013), but made with veg instead of fish. I used a mixture of all the odds and ends of veg in the fridge- onion, swede, green pepper, parsnip, potato, courgette. I fried them in a little walnut oil first until softened, and added them to the sauce at the same time I would have added the fish. It was fantastic, and even better is the spare portion I have in the freezer for my late night once I’m back to work!